A great option for outdoor and indoor banner display with an adjustable display height of up to 13' 6". Comes with a hollow base allowing the option of adding either water or sand as a weighting agent. The constructed unit is easy to position, erect and remove. Our custom fundraising and goal thermometers are great for feedback about donations used, information about your progress or whether you’ve achieved your goals. Used appropriately, Our goal thermometers are a quick and easy visual marker of where you stand. Here you can customize your very own fundraising and goal thermometers using our online design tool. Add your own text or logo. These goal thermometers can be used for a wide variety of things in your office, department, company or charity. Whether you choose to use these goal and donation fundraising thermometers for your sales team or for your local charity donations, these thermometers are sure to help guide you along! Here you can customize your very own fundraising and goal thermometers using our online design tool. Add your own text or logo. These goal thermometers can be used for a wide variety of things in your office, department, company or charity. Whether you choose to use these goal and donation fundraising thermometers for your sales team or for your local charity donations, these thermometers are sure to help guide you along! Pricing - For thermometers that are less than 24" x 36" will be mounted on 3mm white PVC at no additional cost. Do to shipping costs thermometers that our larger than 24x36 will be produced on heavy weight vinyl. If you would like to use a rigid substrate like PVC additional oversize shipping costs can apply to your order. Use these over sized thermometers to help guide you along to reaching any specific goals with in your company or for your own personal use. These thermometers are also good for fund raising events to assist you and others in showing where you stand for obtaining a certain amount of money. A triple goal thermometer can help you with the goal achieving process. A goal thermometer is a great way to keep track of your position and letting others know where you are at in reaching it. Your pier of influence is a leading factor in achieving your goals. They will help you keep on track in order to motivate you to get to the next level. In order to achieve your goal you have to keep reminding yourself of the goal and not forget about where you are at in achieving it. A goal can take years to achieve so the position you are at in achieving the goal is important in order attain it. People need to be reminded of your goal otherwise they will lose interest in the goal and your likelihood in achieving it will diminish. A Goal thermometer is the best way to monitor your progress in reaching your goal. Custom Photo to Canvas is a great new way to display your digital photographs! The simple process of taking a photograph, uploading it to our design tool, and placing the order is all it takes! With this stylish new trend you'll be able to display your finest photographs anywhere you wish, just in a bigger, better, and fun way! If you have an older photograph or any type of picture you want to add to canvas, no problem. These rolled photo to canvas prints come as is. Directly from the printer, we let these non-stretched canvas prints dry and then roll them up like a poster. Rolled prints are great if you want to do your own stretching or gallery wrapping or something completely different on your own. Canvas wrapped around a .75" or 7/16" thick wooden frame with white border. This is the most common choice for customers planning to frame at a later date. The digital image does not wrap around the edges of the wooden frame. They fit well in frames and will not protrude from wall. Gallery Wrap is a method of stretching an artist's canvas so that the canvas wraps around the sides (stretcher bar or strainer bars) and is secured to the back of the wooden frame. The frame is usually 1.5" thick. The result is the hardware (staples or tacks) used for securing the canvas is not visible on the sides. The sides of the canvas are prepared and primed in the same manner as the face, which may then be painted a solid color or painted to continue the image appearing on the face. This method of stretching and preparing a canvas allows for a frameless presentation of the finished product. Choose the appropriate dimensions you want, and upload your photo in seconds. Simply upload a digital photo, stretch to fill the dimensions of the work area, choose any enhancements you may want and proceed to checkout. If you don't see the dimensions you are looking for, just ask. Custom sizes are available upon request. If you have an older photograph or any type of picture you want to add to canvas, no problem. We can scan any photograph at a high resolution and have it done the same way we would with a digital picture. Banners are the most popular type of sign among businesses today. They are versatile, cost-effective, can be made to any size and because they are also flexible and portable, banners can be used for nearly all signage applications. The limitless size and color options available today make it simple to generate maximum exposure with minimum cost. Create a custom 13 oz. vinyl banner here for any occasion. Choose from a wide selection of fonts, special effects, borders, and graphics. Our 13 oz. vinyl banners are reinforced to give you the highest quality and longest lasting banner available. Vinyl banners are a very simple and portable, yet professional way to get your message across. 6 oz. mesh banners are great for outdoor use. Lightweight and durable, our mesh banners are made to withstand heavy winds. These banners are flame retardant and have a flat white finish. Create your own heavy duty 13 oz. vinyl Real Estate related banners here. Choose from one of our templates or create your own from scratch. Simply choose a design and start editing it to your satisfaction. You can customize your background color and text within our easy to use, state-of-the-art design tool. Our full color custom vinyl 13 oz. Holiday and special event banner printing ensures a durable high quality all weather banner that will last indoors or outdoors, in any situation. Our rugged vinyl banners are Perfect for Birthday banners, Mother's and Father's Day banners, Christmas banners, Valentine's Day banners, Thanksgiving banners, Easter banners, Halloween banners, St. Patrick's Day banners, or any other holiday banner you want to create. If you do not see a banner in one of our categories, simply check out our clip art in the design tool section and create your own holiday or special event banner from scratch! Our Holiday Banners are hemmed and grommets every two feet. You will find custom designed templates in each category. Here you will be able to customize any which way you choose, be it background color, fonts, sizes, clip art, or upload your own logo or artwork. Do not hesitate to contact us if you need assistance! Our full color custom vinyl 13 oz. banner printing ensures a durable quality product that will last indoors or outdoors. Perfect for Hockey banners, Baseball/Little League banners, Soccer banners, Basketball banners, Wrestling banners, Football banners, Golf banners, Swimming and Diving banners, gymnastics banners, or any other Sporting banner you want to create. Sport Banners are hemmed and grommeted every two feet. These are all weather banners make for indoor or outdoor use all year round. You will find custom designed templates in each category. Here you will be able to customize any which way you choose, be it background color, fonts, sizes, clip art, or upload your own logo or artwork. Please feel free to contact us with any questions. These high quality durable retail store banners are a great attention getter for any of your Retail needs. Each banner is fully customizable to meet your specifications and is made out of 13 oz. vinyl material. The banners are grommeted every 2 ft and can be used both indoor and outdoor. Click on one of the of the designs below to view the banner pricing and hit customize to add your specific information. Please feel free to contact us with any questions. We have implemented our Sign Design Center so you can conveniently design, preview and order custom signs online without worry or hassle. We offer traffic and parking Control Signs, OSHA Signs, A.D.A. Signs, Engraved Signs, LED Signs, Real Estate Signs, Real Estate Rider Signs, Custom Aluminum Signs, Magnetic Signs, Corrugated Plastic Signs, Name Tags and Name Badge Signs, and License Plates. These antique bronze address plaques scream Style. Using our online design tool you have the option to design your own antique style plaque. With our vast array of different fonts and the numerous color combinations, These architectural plaques are simple to design the way you want them to look and you will have neighbors, friends, and relatives wishing they had one of their own. These simply are a piece of work. Interior Signs are essential to any company’s signage program. The importance of directional signs is two-fold in that they provide your customer with their initial impression of your company as well as helping them find their way. As a result, these signs should be easy to find, see and read. The options for directional and wayfinding signage are nearly limitless. We can create directional signs that will attract attention, establish identity, communicate direction to the public and coordinate with your company’s existing image. Directional Signs provide your customer with their first impression of your company. Exterior signage is essential in assisting the customer in identifying your location. Main identification and Directional Signs will assist in directing customers to your facility. They should be large and easily visible at a distance, should carry your logo and color scheme, and preferably, be illuminated. Rider Signs 6" h x 24-36"
Our approachability Name Tags are a great attention getter and make things easier around the office, in meetings, and conferences. Stop forgetting names and choose us for your Custom Name Tags and Name Badges. They make for a great professional and personal touch. Perfect for when you need a temporary, more economical sign solution! We have many shapes, sizes and colors of corrugated signs to choose from. Your sign will be produced on 4 mm Corrugated Coroplast material is 4mm thick. It resists cracking and is made from polypropylene. Coroplast is an inexpensive choice for a quick and temporary use. Coroplast has flutes that run down its length. It is similar to cardboard but plastic. Removable custom advertising car magnets. Upload a picture or business logo & design your custom magnetic signs here. Or choose from our many graphics and text to create your vehicle magnets. Design, preview and order your Ready To Apply (RTA) vinyl lettering online, using our one-of-a-kind, advanced lettering program. With no minimum quantities or setup charges, we can install the signs or provide complete instructions making installation a snap. Design Vinyl Lettering for your home or office, Car, Truck, Trailer, Van Lettering, Boat Lettering and Snowmobile Lettering also available. Start by selecting a year, then click on the manufacturer make and model of your vehicle. After making a selection, you will be able to design custom vehicle lettering, decals and graphics on top of a scaled drawing of your truck, car, van or SUV. You will be able to position and size vinyl lettering and graphics to fit on your vehicle exactly how you want. When you are finished designing the front, back and sides click on buy now and our site will give you the price for your custom vehicle signs. Installation costs would be calculated separately and billed on a hourly basis. For more information on SIGNS-N-FRAMES installation services of Vehicle Signs and Graphics please click here. Otherwise, we can ship the letters and graphics within days after your purchase. SIGNS-N-FRAMES vehicle lettering and wraps are full-color digital graphics that are designed to fit your vehicle. The letters and graphic is carefully applied to your vehicle, completely covering all surfaces. Full Color images are an eye-catching way to turn your vehicle into a mobile billboard, without damage to your vehicle. SIGNS-N-FRAMES can completely or partially wrap your vehicle. We can even safely cover the glass and windows, allowing individuals inside the vehicle to see out while those outside are shown your logo or company's messages. Vinyl lettering can turn your vehicle into a moving advertisement! The custom color and graphic capabilities of digital printing allow SIGNS-N-FRAMES to customize your car, truck or van to meet your needs providing graphics of all shapes and sizes and even your logo. That translates into advertising that gets you noticed and builds brand awareness for your company. Neatly display custom vinyl store front window lettering on your windows or doors of business showing the world your hours of operation. Have these hours of operation decals tell the people visiting when the doors open and when they close for the day. Using our online design tool, you have the option to design your Store Front Window Lettering via one of our pre-designed templates, or from scratch. You have the option to upload your business logo and add it wherever you would like. Choose from different fonts and effects if you would like as well. Please note that we are only using a gray background to show the text, this gray backing will not be apart of your order. Using a lighter color text is the best option when it comes to window lettering in order to obtain maxim efficiency. If choosing a darker color font, the best option is to add a white border. Please see examples. Ready to Apply (RTA) Vinyl Wall Lettering or Wall Stenciling that can be applied to painted walls, most wallpapers, windows, mirrors, furniture, ceramic tile, wood almost any smooth to semi-smooth surface. Our custom wall lettering is easy to apply and to remove. Design wall lettering or call or email us for custom wall quotes. Either way you can choose any of our custom fonts and our dozens of color choices to customize your own wall lettering! Wall lettering are manufactured using vinyl with adhesive backing. They are cut to the shape, size, and font style of your choosing. They are easily installed by removing the backing paper and applying the wall words to any smooth wall surface. Custom Vinyl Wall Lettering is a great way to add eye-catching design to a room. It is inexpensive and can be applied without damaging walls. It a great choice for personalizing your apartment or home. Using our Wall Lettering Design Tool, you can choose from countless fonts, colors and effects to get the wall lettering you desire. Wall Lettering also makes a great gift! Design and preview all types of Ready to Apply (RTA) vinyl lettering online. Hundreds of fonts and styles to choose from. Add borders, shadows, italics and more for your own Custom looking RTA vinyl lettering. Additional Information Vinyl lettering is ready to apply, self-adhesive lettering. Vinyl lettering comes pre-spaced in words or phrases as needed. Simply peel off the paper backing and the vinyl lettering will stick to the (Pre Applied) masking. Apply in one application. Once positioned correctly just smooth on firmly then remove the Masking, leaving the vinyl lettering. The result will be clean cut perfectly spaced lettering that looks hand lettered by a professional! Where can Vinyl Lettering be used? Vinyl lettering is a perfect choice for use on Boats, Jet Skis, Personal Watercraft, Kayaks, Snowmobiles, Hotrods, Race Cars, Trucks, Vans, SUVs, Other Vehicles, Windows, Storefronts, and virtually any other smooth surface. We are the leader in ready-to-apply (RTA) vinyl lettering and graphics. Custom vinyl lettering and graphics can automatically transform the look of your facility. They can be applied to virtually any smooth surface including windows, walls, doors, floors and even vehicles. From your logo to custom colors, vinyl lettering and graphics are a great way to get noticed. Get effective advertising from your window space with Ready to Apply Vinyl Letters. Simply type in the size of the window area you have to work with, select and position attention grabbing graphics, and add your text. Stand out from other businesses and create your own Custom RTA Vinyl Lettering today using or new online design tool! Additional Information Premasked and Ready to Apply High Performance Vinyl with Laminate 3-5 Year Outdoor Durability Get effective advertising from your window space. Choose from Graphics and Ready to Apply Vinyl Lettering to jazz up your snowmobile or select Registration Numbers to comply with Government Regulations. Using our state-of-art online design tool, you have the option to customize your RTA lettering for an added bonus. Choose from Graphics and Vinyl Lettering to jazz up your snowmobile or select Custom Registration Numbers to comply with Government Regulations. All Vinyl Lettering is Ready to Apply. Do you have a poster that would be great for advertising, but do not have anyway to display it? Drive people to your door or event with a poster display, stand, or frame. For use either outdoors or indoors, we are sure to carry a poster display or frame to fit your needs. We use a six color UV resistant printer for printing all of our posters.Turn your digital photos into priceless works of art using our online design tool, where you can easily upload a photo of your choice and add right to the dimensions of your choice. Choose to add text or leave as is. Checks like this always make for a fun time. Basically what you have is an enlarged standard check, but customizable to how you like it. Using our online design tool, you can custom create a check to work for whatever event you want it to. These "Big" checks are always a hit, and always a great attention getter. Birthdays, Wedding Gifts, Corporate Events, Sporting Events, Contest Winners, Casino Prizes. So what are you waiting for? Design your very own Custom Oversized Novelty Check today! Big award checks, Big reward checks, Large business checks, Big dry erase checks and oversized nonprofit checks are other options for these fun novelty checks ! The pricing below includes your graphics and text printed onto a 13 oz. vinyl banner material which can used for indoor or outdoor purposes. Click onto the customize icon to customize your own sponsorship sign. If you would like a sponsorship poster instead of a sponsorship banner please select the material icon next to the product picture. You can choose from from Foam Core, PVC, lamination, or even Coroplast. These sponsorship signs are perfect for fund raising events for chamber of commerces, non-profits, sporting events, charities, communities, or businesses. SIGNS-N-FRAMES firmly believes in the activities of all the non-profit organizations around the world. It is our commitment to help provide a sign service to these non for profit organizations. With the decline of the current economic state we understand that corporations have reduced the amount of giving. Consequently in an effort to help the non-profits around the world, we will offer a 20% discount. In order to redeem further incentives, we will offer additional discounts for each inbound link coming from your organizations website. We will give you an additional 10% off your purchase for each Google Page Rank. For example, a link from a Google Page Rank of 3 would qualify you for an additional 30% discount, making your entire order 50% off. Here you will find signs, banners, lettering, decals, posters and more all related to your non-profit organization. From Kiwanis Clubs to the Boy Scouts of America, you will be able to find something you are looking for here, be it a custom sign, a personalized vinyl banner, or decals. SIGNS-N-FRAMES firmly believes in the activities of all the non-profit organizations around the world. It is our commitment to help provide a sign service to these non for profit organizations. This is why we will begin with 20% off all our products. Other discounts apply can apply with links to our website. Boy Scouts of America signs, banners, and frames. The Boy Scouts of America is one of the nation's largest and most prominent values-based youth development organizations. The BSA provides a program for young people that builds character, trains them in the responsibilities of participating citizenship, and develops personal fitness. Using our online design tool you have the ability to custom design your own Boy Scout or Cub Scout banners, stickers, decals, and signs. Choose from one of our templates or create your own from scratch. We are offering a 20% discount on all items listed below to members of this non-profit organization. To receive your discount, please enter BOYSCOUT at checkout. Girl Scouts of the USA is the world’s preeminent organization dedicated solely to girls—all girls—where, in an accepting and nurturing environment, girls build character and skills for success in the real world. In partnership with committed adult volunteers, girls develop qualities that will serve them all their lives, like leadership, strong values, social conscience, and conviction about their own potential and self-worth. Using our online design tool you have the ability to custom design your own Girl Scouts of America banners, stickers, decals, and signs. Choose from one of our templates or create your own from scratch. We are offering a 20% discount on all items listed below to members of this non-profit organization. To receive your discount, please enter GIRLSCOUT at checkout. The American Cancer Society is the nationwide, community-based, voluntary health organization dedicated to eliminating cancer as a major health problem by preventing cancer, saving lives, and diminishing suffering from cancer, through research, education, advocacy, and service. Using our online design tool you have the ability to custom design your own Cancer Society banners, stickers, decals, and signs. Choose from one of our templates or create your own from scratch. We are offering a 20% discount on all items listed below to members of this non-profit organization. To receive your discount, please enter CANCER at checkout. The American Red Cross is where people mobilize to help their neighbors—across the street, across the country, and across the world—in emergencies. Each year, in communities large and small, victims of some 70,000 disasters turn to neighbors familiar and new—the more than half a million volunteers and 35,000 employees of the Red Cross. Through over 700 locally supported chapters, more than 15 million people gain the skills they need to prepare for and respond to emergencies in their homes, communities and world. Using our online design tool you have the ability to custom design your own American Red Cross banners, stickers, decals, and signs. Choose from one of our templates or create your own from scratch. We are offering a 20% discount on all items listed below to members of this non-profit organization. To receive your discount, please enter REDCROSS at checkout. The Fraternal Order of Police is the world's largest organization of sworn law enforcement officers, with more than 325,000 members in more than 2,100 lodges. We are the voice of those who dedicate their lives to protecting and serving our communities. We are committed to improving the working conditions of law enforcement officers and the safety of those we serve through education, legislation, information, community involvement, and employee representation. No one knows the dangers and the difficulties faced by today's police officers better than another officer, and no one knows police officers better than the FOP. Using our online design tool you have the ability to custom design your own Fraternal Order of Police banners, stickers, decals, and signs. Choose from one of our templates or create your own from scratch. We are offering a 20% discount on all items listed below to members of this non-profit organization. To receive your discount, please enter POLICE at checkout. Kiwanis, through guidance and example, works to develop future generations of leaders. Every day, Kiwanians are revitalizing neighborhoods, organizing youth-sports programs, tutoring, building playgrounds, and performing countless other projects to help children and communities. Using our online design tool you have the ability to custom design your own Kiwanis Club banners, stickers, decals, and signs. Choose from one of our templates or create your own from scratch. We are offering a 20% discount on all items listed below to members of this non-profit organization. To receive your discount, please enter KIWANIS at checkout. We are a nonprofit, ecumenical Christian ministry founded on the conviction that every man, woman and child should have a decent, safe and affordable place to live. We build with people in need regardless of race or religion. We welcome volunteers and supporters from all backgrounds. Using our online design tool you have the ability to custom design your own Habitat for Humanity banners, stickers, decals, and signs. Choose from one of our templates or create your own from scratch. We are offering a 20% discount on all items listed below to members of this non-profit organization. To receive your discount, please enter HABITAT at checkout. The Salvation Army, an international movement, is an evangelical part of the universal Christian Church. Its message is based on the Bible. Its ministry is motivated by the love of God. Its mission is to preach the gospel of Jesus Christ and to meet human needs in His name without discrimination. Using our online design tool you have the ability to custom design your own Salvation Army banners, stickers, decals, and signs. Choose from one of our templates or create your own from scratch. We are offering a 20% discount on all items listed below to members of this non-profit organization. To receive your discount, please enter SALVATION at checkout. The Knights of Columbus organization was formed to render financial aid to members and their families. Mutual aid and assistance are offered to sick, disabled and needy members and their families. Social and intellectual fellowship is promoted among members and their families through educational, charitable, religious, social welfare, war relief and public relief works. Using our online design tool you have the ability to custom design your own Knights of Columbus banners, stickers, decals, and signs. Choose from one of our templates or create your own from scratch. We are offering a 20% discount on all items listed below to members of this non-profit organization. To receive your discount, please enter KNIGHTS at checkout. Whenever a Lions Club gets together, problems get smaller. And communities get better. That's because we help where help is needed – in our own communities and around the world – with unmatched integrity and energy. Using our online design tool you have the ability to custom design your own Lions Club International banners, stickers, decals, and signs. Choose from one of our templates or create your own from scratch. We are offering a 20% discount on all items listed below to members of this non-profit organization. To receive your discount, please enter LIONS at checkout. To inculcate the principles of Charity, Justice, Brotherly Love and Fidelity; to recognize a belief in God; to promote the welfare and enhance the happiness of its Members; to quicken the spirit of American patriotism; to cultivate good fellowship; to perpetuate itself as a fraternal organization, and to provide for its government, the Benevolent and Protective Order of Elks of the United States of America will serve the people and communities through benevolent programs, demonstrating that Elks Care and Elks Share. Using our online design tool you have the ability to custom design your own Elks Club International banners, stickers, decals, and signs. Choose from one of our templates or create your own from scratch. We are offering a 20% discount on all items listed below to members of this non-profit organization. To receive your discount, please enter ELK at checkout. YMCA stands for Young Men’s Christian Association. It is a world-wide Christian, ecumenical, voluntary Movement for women and men with special emphasis on, and the genuine involvement of, young people, which seeks to share the Christian ideal of building a human community of justice with love, peace and reconciliation for the fullness of life for all creation. Using our online design tool you have the ability to custom design your own YMCA banners, stickers, decals, and signs. Choose from one of our templates or create your own from scratch. We are offering a 20% discount on all items listed below to members of this non-profit organization. To receive your discount, please enter YMCA at checkout. Since 1980, the Make-A-Wish Foundation has enriched the lives of children with life-threatening medical conditions through its wish-granting work. The Foundation's mission reflects the life-changing impact that a Make-A-Wish experience has on children, families, referral sources, donors, sponsors, and entire communities. Using our online design tool you have the ability to custom design your own Make-A-Wish Foundation banners, stickers, decals, and signs. Choose from one of our templates or create your own from scratch. We are offering a 20% discount on all items listed below to members of this non-profit organization. To receive your discount, please enter WISH at checkout. Wind Sail Signs - Bowflags, feather flags, Wind signs, Outdoor wind sail signs, Outdoor signs and banners, T-Pole Signs, Flag Banner signs, Fabric banner signs and flags. Photos On Canvas Printing - We can take your photograph old or new, print it on canvas, wrap it in a stretcher frame so that the picture wraps around the sides and give it back to you ready to hang. This is called a Gallery Wrap. We can also print on canvas trim and cut to size so that you can frame it. Fundraising Goal Thermometers - We have a wide selection of fundraising goal thermometer charts that are great for almost any application. You can upgrade it to have dry erase. Banner Stands - Purchase trade show banner stands online. Vinyl Window Lettering - Get effective advertising from your window space with ready to apply vinyl lettering. Indoor and Outdoor Wall Lettering - Design indoor wall words for the walls or customize your business sign for outdoors. Vinyl Lettering - Design custom vinyl lettering for any of your business or personal needs. Vehicle Lettering - Design Ready to Apply Vehicle Lettering for your Car, Truck, Van or SUV. Vinyl Trailer Lettering - Create custom Ready To Apply vinyl trailer lettering for your trailer. Custom Stairwell Signs - These Custom Evacuation Directional Signs provide critical information for employees and rescue personnel. Oversized "BIG" Fundraising Novelty Checks - Design your own customizable oversized checks online. Engraved Signage - Here you will find American Disabilities Act (ADA) Signs, Engraved Signs, Room signs, Directional Signs and Name Plates. Custom Boat Lettering and Boat Registration Numbers - Design custom Ready to Apply vinyl lettering and graphics for your boat or get a set of boat registration numbers. 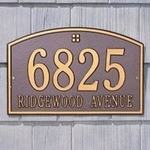 Custom Aluminum Signs - Design your own custom aluminum signs online. ADA Signs - Interior Signs are essential to any company’s signage program. Menu Boards - Use our online design tool to custom design restaurant menu displays that draw attention to your food or drink products. Retractable Banner Display Systems - Purchase Trade Show Banner Stands Online. Mesh Banners - Design Custom Mesh Banners Online. Tradeshow Signs & Displays - Banner stands, Retractable stands, pop hop displays, Fabric Displays, Table Runners, Collapsible literature racks and more. Custom Fence Banners and Wraps - Custom design mesh and vinyl fence banners and wraps online. Hospital Signage - Design custom hospital signs online. Outdoor Banners - Design outdoor banners, fence wraps, wind sail signs and more online! Storefront Signs - Using our design tool, design numerous styles of storefront signage online. Sidewalk Displays - Choose from an assortment of wind sail banners, a-frame signs, signboards and more. Street Banners - Custom design a vinyl or mesh street banner or wind sign sail flags online. Hours of Operation Lettering - Design custom vinyl store window hours of operation lettering. Retail Store Banners - Online retail store banner design. Fence Banners - Custom design mesh and vinyl fence banners online. Birthday Banners - Design fancy custom vinyl or mesh birthday banners online with our online design tool. Custom Political Signage - Design your own political sign or choose from our political templates that allow you to customize information like candidates name, associated websites, polling places and more.